Refinement of a pdb-structure and Convert A. Search for a pdb with the closest sequence to your protein of interest. B. Choose the most suitable entry. 1 Refinement of a pdb-structure and Convert A. Search for a pdb with the closest sequence to your protein of interest. B. Choose the most suitable entry (or several entries). C. Convert and resolve errors and uncertainties. X-ray with up to 2.5-2.8A resolution is preferable over NMR NMR or homology models are only dockable by skillful operators Forget electron microscopy X-ray Resolution < 2.2 A is preferable. 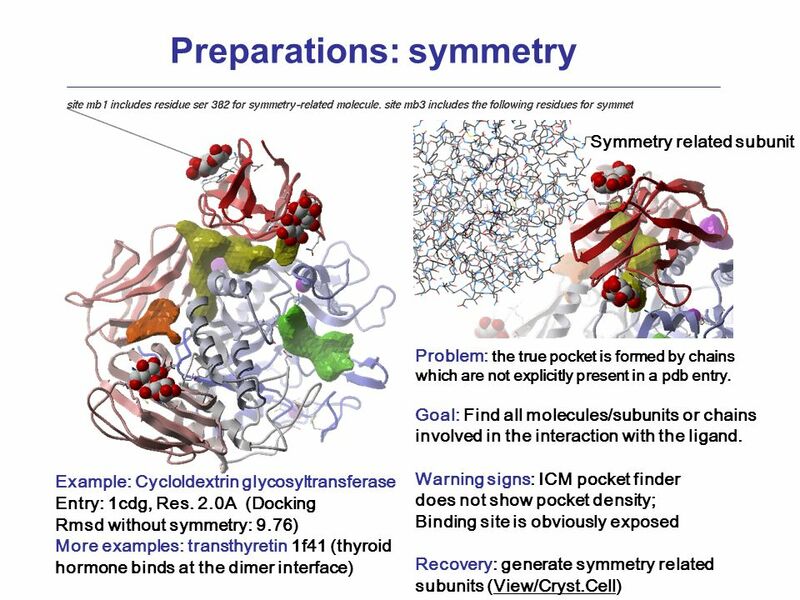 (Structures with resolution > 2.3 A may have up to 30% peptide flips, the maps are not self-refinable) Analyze symmetry if the pocket might be at the interface Analyze relative b-factors. B > 100. are not credible Pay attention to occupancies. 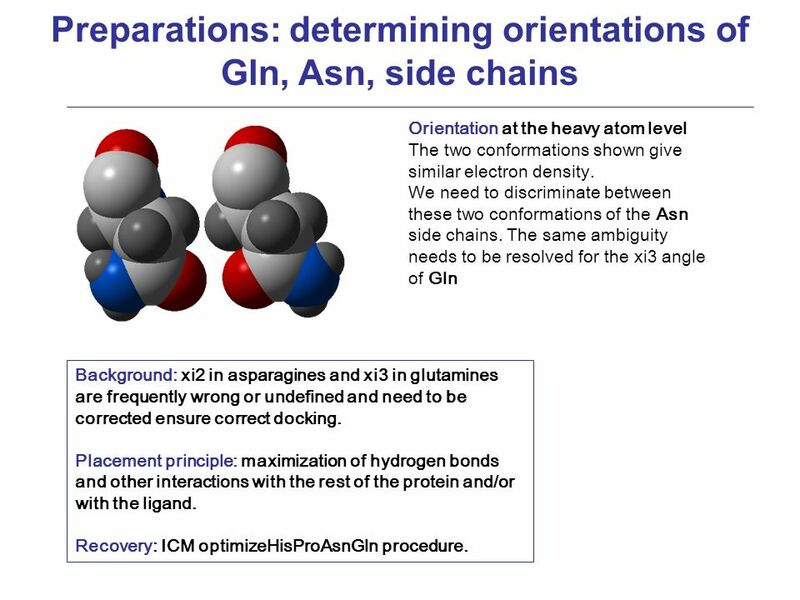 Analyze alternative positions Check orientations of His, Asn, Gln Check protonation states of Glu, Asp, His Analyze stongly bound water molecules, ions and co-factors. 7 Preparations: do I need to uncharge Asp, Glu, Lys and Arg? 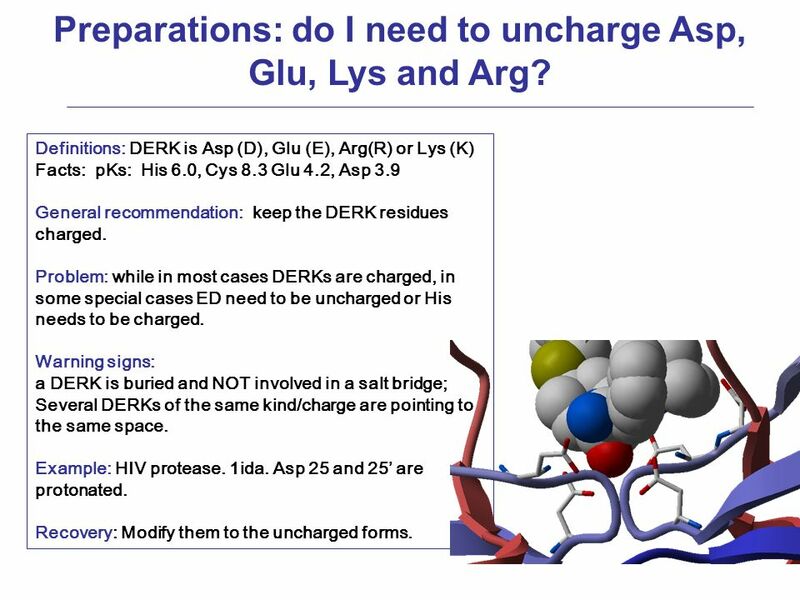 Definitions: DERK is Asp (D), Glu (E), Arg(R) or Lys (K) Facts: pKs: His 6.0, Cys 8.3 Glu 4.2, Asp 3.9 General recommendation: keep the DERK residues charged. Problem: while in most cases DERKs are charged, in some special cases ED need to be uncharged or His needs to be charged. Warning signs: a DERK is buried and NOT involved in a salt bridge; Several DERKs of the same kind/charge are pointing to the same space. Example: HIV protease. 1ida. Asp 25 and 25 are protonated. Recovery: Modify them to the uncharged forms. 8 Preparations: which waters to keep? Definition: crystallographic water: an oxygen placed by a crystallographer or a refinement program to a blob of electron density. 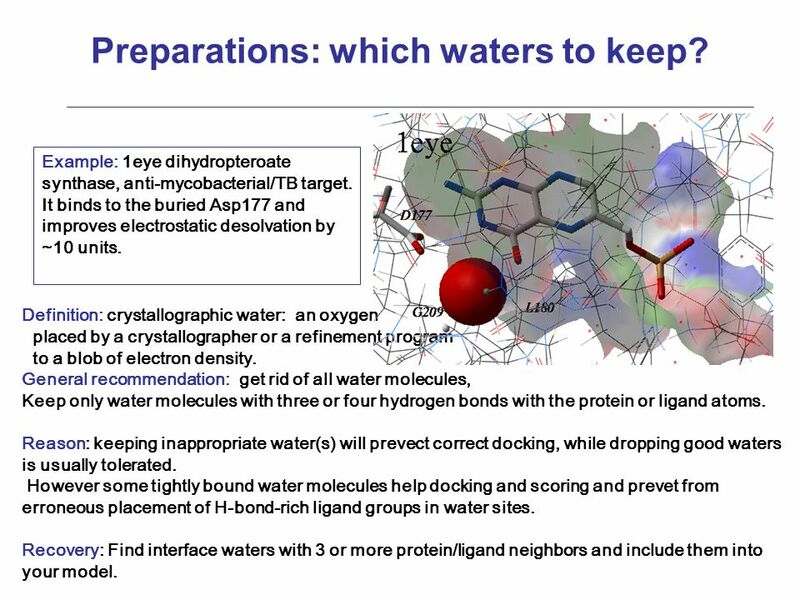 General recommendation: get rid of all water molecules, Keep only water molecules with three or four hydrogen bonds with the protein or ligand atoms. Reason: keeping inappropriate water(s) will prevect correct docking, while dropping good waters is usually tolerated. 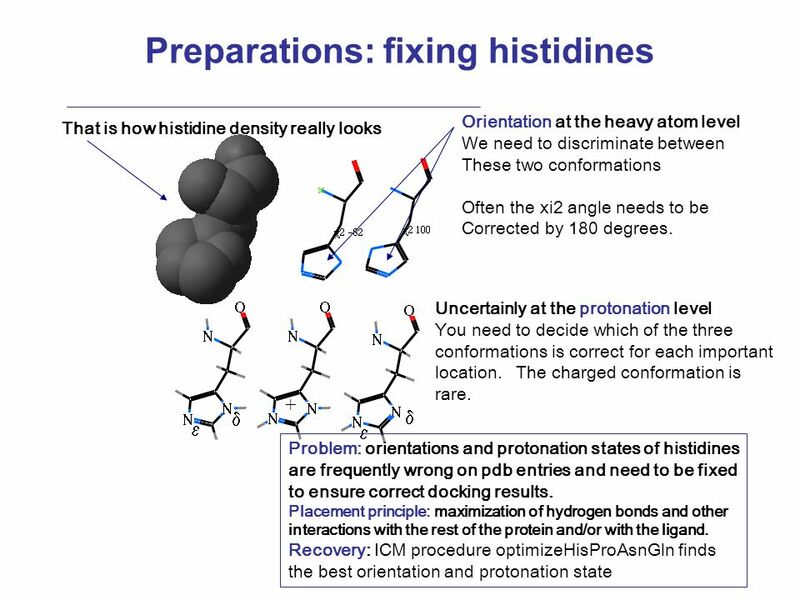 However some tightly bound water molecules help docking and scoring and prevet from erroneous placement of H-bond-rich ligand groups in water sites. 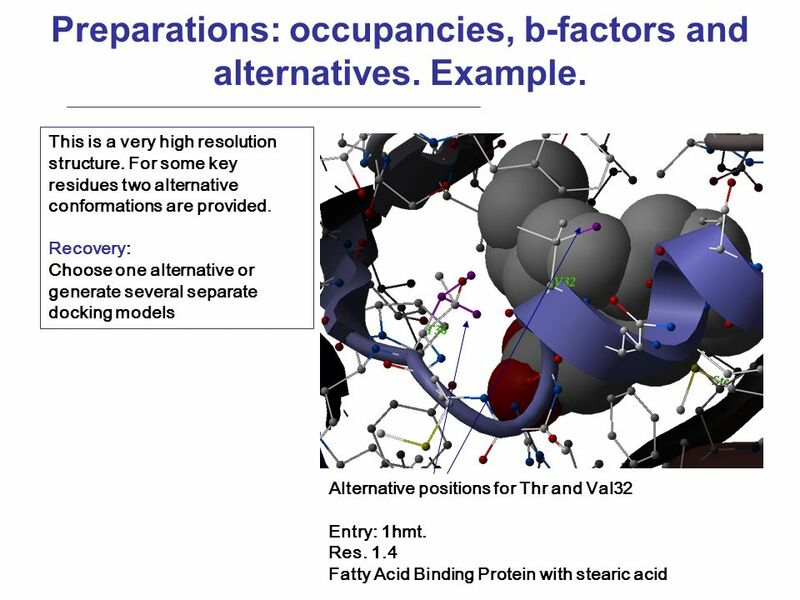 Recovery: Find interface waters with 3 or more protein/ligand neighbors and include them into your model. Example: 1eye dihydropteroate synthase, anti-mycobacterial/TB target. It binds to the buried Asp177 and improves electrostatic desolvation by ~10 units. 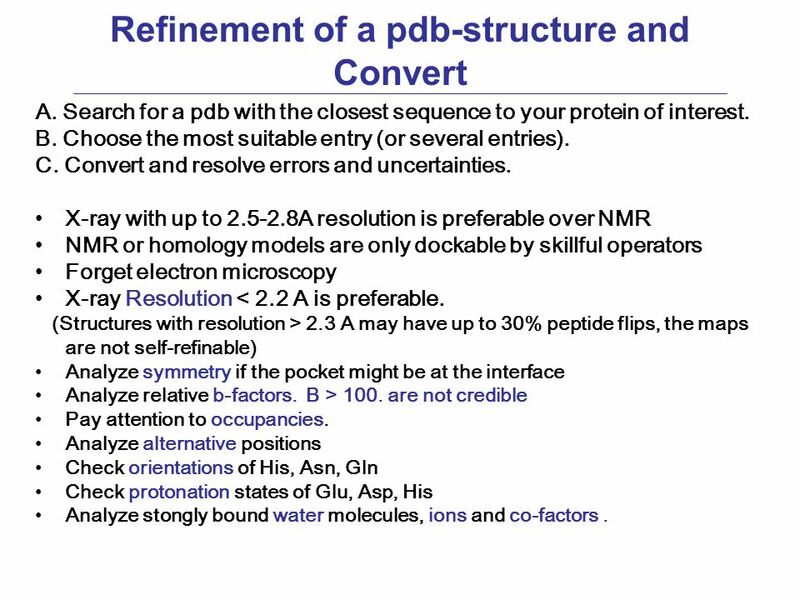 Download ppt "Refinement of a pdb-structure and Convert A. Search for a pdb with the closest sequence to your protein of interest. B. Choose the most suitable entry." François Fages MPRI Bio-info 2007 Formal Biology of the Cell Protein structure prediction with constraint logic programming François Fages, Constraint. Determination of Protein Structure. Methods for Determining Structures X-ray crystallography – uses an X-ray diffraction pattern and electron density. Rosetta Energy Function Glenn Butterfoss. Rosetta Energy Function Major Classes: 1. 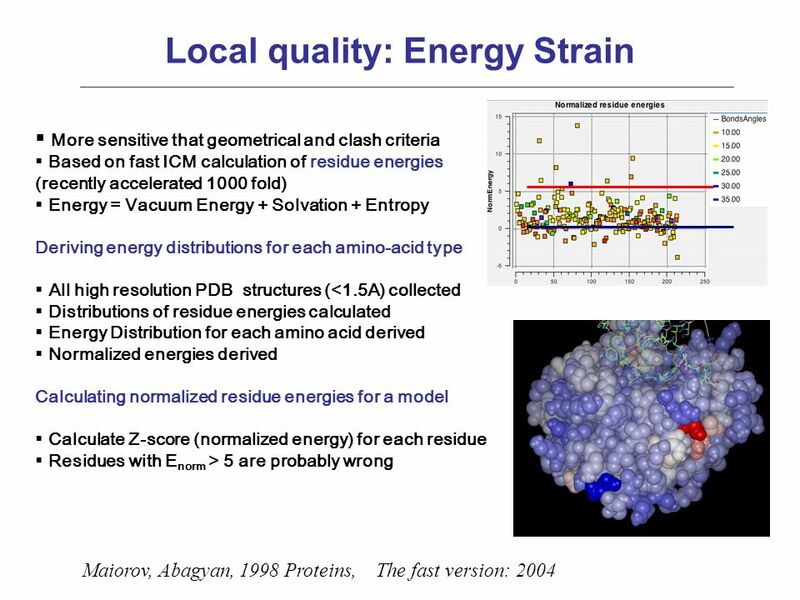 Low resolution: Reduced atom representation Simple energy function. 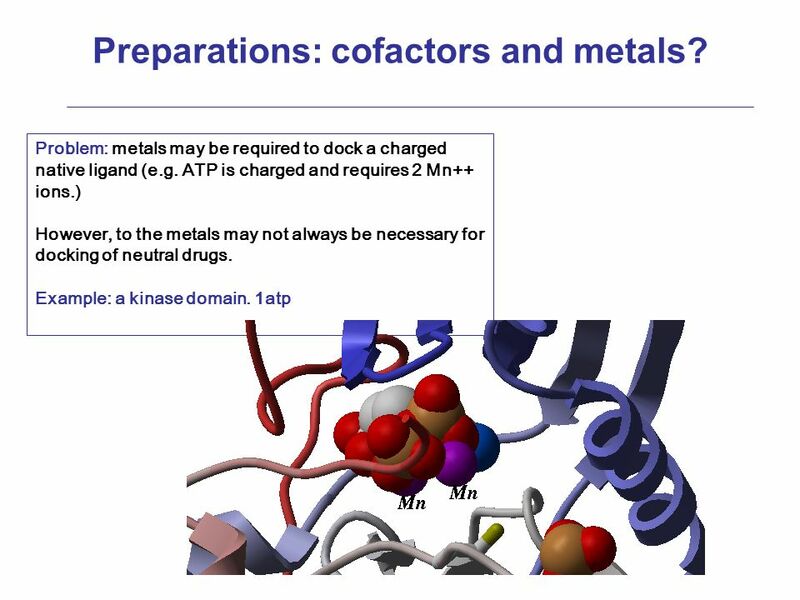 Lecture 15: Regulation of Proteins 2: Allosteric Control of Hemoglobin Hemoglobin and Myoglobin Allosteric Transition in Hemoglobin Physiological Role. Hemoglobin Presented to Bioinformatic MN1 10 p course, Spring term 2006 by Amirah Khan With acknowlegment to Miriam Geörg & Björn Garpefjord. Protein Structure/Function C483 Spring Proteins segments which fold first can promote the folding of other sections of the protein into the native. Background Goals Methods Results Conclusions Implications. Structure Validation using Coot Paul Emsley Mar 2007 York University of York. QM/MM Study of Cytochrome P450 BM3 Catalysis Mechanism and Application in Drug Design. Seminar series 2 Protein structure validation. In 't verleden ligt het heden; in 't nu, wat worden zal. The past: Linus Pauling ‘Inventor’ of helix and. CENTER FOR BIOLOGICAL SEQUENCE ANALYSISTECHNICAL UNIVERSITY OF DENMARK DTU Homology Modelling Thomas Blicher Center for Biological Sequence Analysis. Structure validation Everything that can go wrong, will go wrong. Everything that could go wrong has gone wrong. Especially with something as complicated. 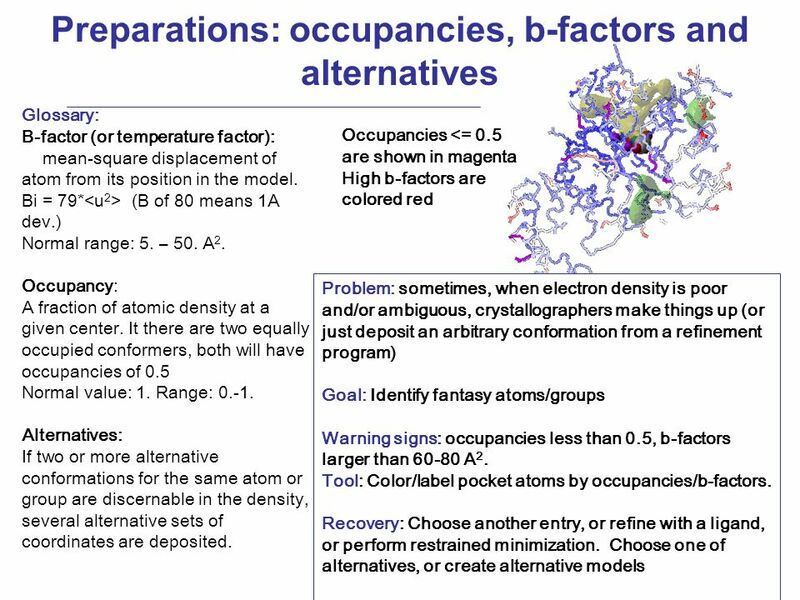 1 Computational Biology, Part 11 Retrieving and Displaying Macromolecular Structures Robert F. Murphy Copyright  1996, 1999, All rights reserved. Crystallography: An introduction Harma Brondijk Crystal and Structural chemistry, Utrecht University.